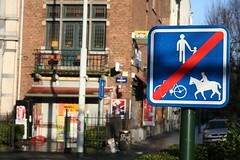 I was taking this photo of a sign in one of Brussels' squares when a friend appeared at my side and asked why I was taking this shot. I liked the arrangement of the sign with the many other signs and hoardings in the background, making so much clutter. It's actually uncommon for so much 'noise' in Brussels, especially when compared to other cities.